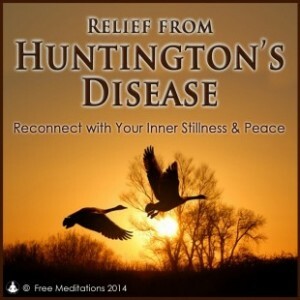 I am absolutely thrilled and nothing less than excited to announce that Simon Rowe, psychotherapist and co-founder & co-owner at freemeditations.co.uk has created a meditation specifically to help people with Huntington’s disease. When Simon suggested recording the meditation I jumped at the chance to say ‘yes please’. I know and understand the healing power that meditating has, as you give your full awareness to it. Indeed, my own relative was diagnosed with ‘terminal’ pancreatic cancer and the medical profession were talking about hospices and suggesting that there was no point in carrying out surgery for her. ELEVEN years on she is still living an active life, part of which includes regular and deep meditations. When science can’t find the answer we must look deeper into ourselves. My relative is not cured, but her story is remarkable. There is much going on in the field of energy healing and I would recommend anyone and everyone to engage in regular meditation as an aid to reliving stress, healing and staying healthy. Relief from Huntington’s Disease is a meditation that can relax and calm your fear. Simon is an extremely experienced psychotherapist and creator of meditations and for those of you who are not familiar with either concept, I urge you to let go of any fear or preconception and relax into the voice that will guide you to where you need to be. I have faith that this mediation will reach those that it needs to reach and that it will help and heal those that it needs to help and heal. Remember, a person with HD also has the other regular issues that someone without HD can have, such as blocks from childhood experiences and normal fears and doubts on top (or underneath) the other issues that HD brings with it. Of course there is no claim that listening will immediately evoke a cure, however the positive effects of meditation are well documented. With repeated, regular use the powerful self-healing mechanism within the body and mind can be activated more strongly. It is fine to use this healing meditation in combination with other traditional and/or holistic methods of treatment. If you have never experienced a guided meditation before, and find it difficult to concentrate on what Simon is saying, just take a long deep breath into your abdomen, and then let go of the tension as you breath out again. Let go of ‘trying’. Your unconscious self will absorb what it needs to. Whilst listening to the meditation, you can enjoy a calming process of settling the mind and body as you are guided to reconnect with the stillness in the depths of your being and activate the body’s innate self-healing mechanism to support and enhance the quality and experience of your life. This meditation will help you to de-stress, let go of fear and relax into yourself which will, in turn help you to cope with your everyday life. It may help with your self-esteem and I believe that, at a deeper level, healing can take place. In my mind, anything is possible. The meditation is given at a cost of £3.99 but if you use this code HDDG20 which Simon has created for us, you will receive a 20% discount. I truly believe that this is a great investment in your health and wellbeing and every download will generate a £1 donation to the HDA. I thank Simon for this kind and generous offer and for spreading the energy this way. For the best effect, please use headphones. It is recommended that you listen to this Meditation on a daily basis. Ideally, set aside 45 minutes in a peaceful and comfortable place where you will not be interrupted. *Please note that no claims are made regarding the curative nature of this Guided Meditation. This is no substitute for ongoing personal healthcare. This recording is offered as an adjunct to assist and support those with their individual healing journey. For more information on accessing support for Huntington’s Disease, please visit: The Huntington’s Disease Association. This entry was posted in Huntington's disease and tagged HDA, healing, Huntingtons, Huntingtonsdisease, Meditation on February 7, 2014 by Deborah.